Home » vehicle graphics » That's A Wrap! Custom Sprint Car! 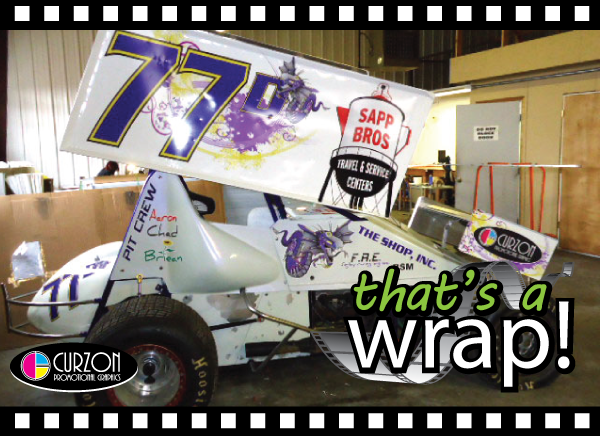 Check out our latest wrap! Curzon is the official sponsors of the Sprint Car owned by Keith Dragoo of Sapp Bros. Check out these amazing before and after pics that truly show the power of a vehicle wrap! Sprint Cars are high-powered race cars designed primarily for track racing. Because of their high power-to-weight ratio these cars can make speeds in excess of 140 miles per hour! You can check out this car in action live at Eagle Raceway! This is just another example of how our wraps can be placed on cars, trucks, buses, trailers, SPRINT CARS, and much more! Call us for more details!